Rock Bottom is the testimony of a young man who grew up in the home of a severe alcoholic. He suffered many kinds of abuse starting at the age of 4. As a young man he began to indulge in drugs and alcohol which led him to many years of incarceration. Two and a half years before his release God used his father to speak to him just before his passing. He uttered these words “I hope you are saved someday kid.” He gave his life to God that night in that little cell. He walked with the Lord for the last 2.5 years of his 10 years in prison and was released December 3, 2009. Shortly after his release the Lord told him to write a book. 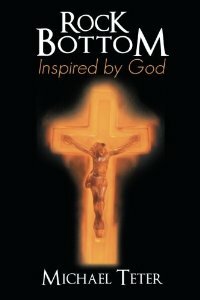 Almost three years later Rock Bottom was published, he gives God all glory, honor, and praise. He continues to serve the Lord this day. The great commission and objective of our ministry is to take gospel of Jesus Christ to unreached areas. Matthew 28:18-20.We goes house to house do bible study. Prayers for the people and invites them to our church for further teachings. My humble request to you , if in your ministry are blessed with Bibles and other Christian books, Kindly send to us for soul saving work in Kenya. The bible says in Galatians 6:9 we must not become tired of doing good. We will receive our harvest of eternal life at the right time if we do not give up. Our prayers are with you always as you share Gods love with others and May Jesus comes soon we go to rest in Heaven. Finally keep us in your daily prayers . You are quite welcome, and thank you for the prayers Kelly. I find great encouragement in them. Many blessings to you. Merry Christmas and thank you Natalie, if this is His will in my life please pray for me because I am a willing Soldier for Jesus Christ our Lord and Savior. Hallelujah! Thank you for your kind words my friend. God bless you.